Around 4 years ago I purchased a WHFB army from one of our locals. 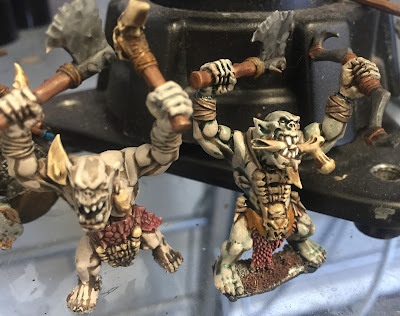 While this was generally played as the typical "Green Dwarfs" of the era by the original owner, the army was interesting as it included both Black Orcs and Orc Boyz as well as the obligatory Savage Orc horde and war engines. The other thing that was interesting was that they were semi-albino Orcs coming from the cooler climes. They were effectively a stone colour with no green pigment and mounted on mountain snow bases. After finishing the Goblins I thought I'd move onto multibasing the orcs and so last evening I removed 100 Orcs from there plastic bases. My intent is to create a Horde of Ax, a Horde of Greatax and two Regiments of Morax (with some Morax left over for Fight Wagons). As part of the process, I am going to take the opportunity to alter the skin tone of the Orcs. 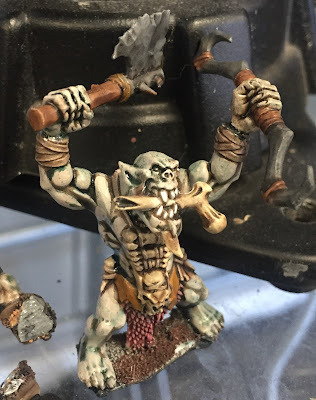 They will still be Pale Orcs but with an underlying tilt to green orcy heritage. Here you can see the change I am effecting. 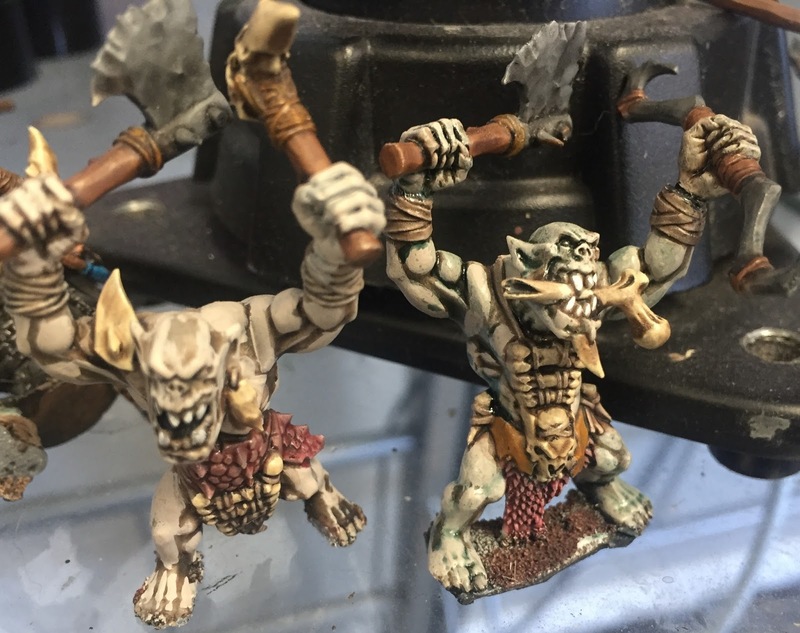 On the left is the Pale Orc and on the right the same paintjob but after a wash of Coelia Greenshade from Citadel. I tried the Biel-Tan Green Shade, the Waywatcher Green Glaze and even a watered down wash of Warboss Green paint but preferred the Coelia finish. The wash provides better definition and I prefer the greenish tint over the pure stone finish. I'm now waiting for my MDF bases to arrive from Sarissa so I can get these multibased and on the table.